Small, lightweight and effective. 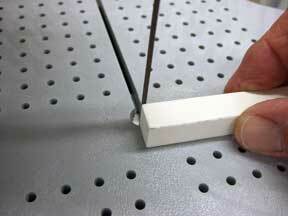 the rubber pad holds small pieces securely and prevents cuts and chipped nails. About the handiest accessory for grinder or saw. Plug the switch into your outlet, your grinder into the switch and tap your toe. No more reaching to switch your saw or grinder on and off each time you go to use it. A major timesaver that is used in professional glass studios. This is what you need to keep your work area clean and dry. 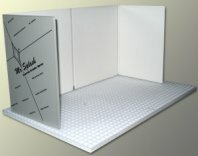 This vinyl splash guard unfolds to a 12x36” hinged guard. Has cut out for the grinder cord. Works with all grinders. IDEA! Place your grinder on a Morton Glass Works Mini Surface (#0500) and set up Mr. Splash around your grinder. Excess water from your grinder will then be caught in the grid, eliminating puddles on your work bench. Apply a dab of Shaft Lube on your grinder motor shaft before sliding the bit on. Helps prevent the dreaded seized bit issue that vexes grinder users everywhere. The best $3 you can spend on your grinder. 3 gram packet will last quite a while.